What better way to start or end the school year than to surprise your teacher with something sweet, like a personalized, buttery, chewy, crispy GIANT chocolate chip cookie! This giant chocolate chip cookie is so simple to whip together, with no mixer required and is so much more fun to receive than a traditional batch of cookies. Or, go with a simple store-bought alternative and still stick with the "smart cookie" theme. 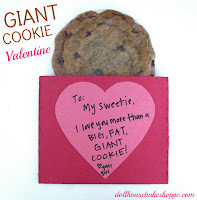 You may remember this giant cookie gift from my Giant Cookie For Santa or my Giant Cookie Valentine. This is the same idea, I just created a variation on my themed cookie pouch, perfect for giving to your favorite teacher (I can't wait to share my other variations with you, too, the possibilities are endless)! To make the cookie pouch, I simply trimmed 4-inches off the bottom of a piece of lined notebook paper so the cookie will fit snugly (construction paper can also be used). Next, I punched a third hole on the side and sewed together the edges with a needle and red thread but you can also use yarn with holes punched up the sides for kids to "sew" the sides up themselves. You can alternatively tape or staple the sides together. I then decorated the pouch with markers. You can get creative here and personalize your cookie pouch with markers, stickers, or let the kids draw a picture or write their own name or message. Add your "smart cookie" and your gift pouch is ready for giving! You can even use store bought packages of cookies if you want a quick last minute gift idea. 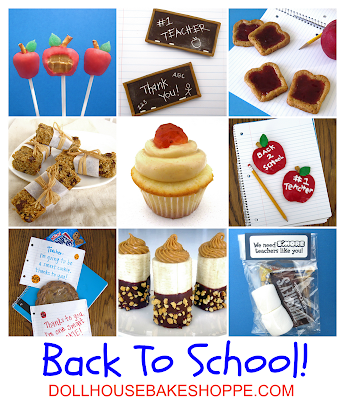 Click here for more fun Back to school themed recipes and treat ideas!